‘Ice Dragon’ o.0 That will be epic coloured in. And here Sedrick probably thought that he killed all of Arthur’s dragons. Silly Sedrick, you really shouldn’t mess with a guy’s pets and family. 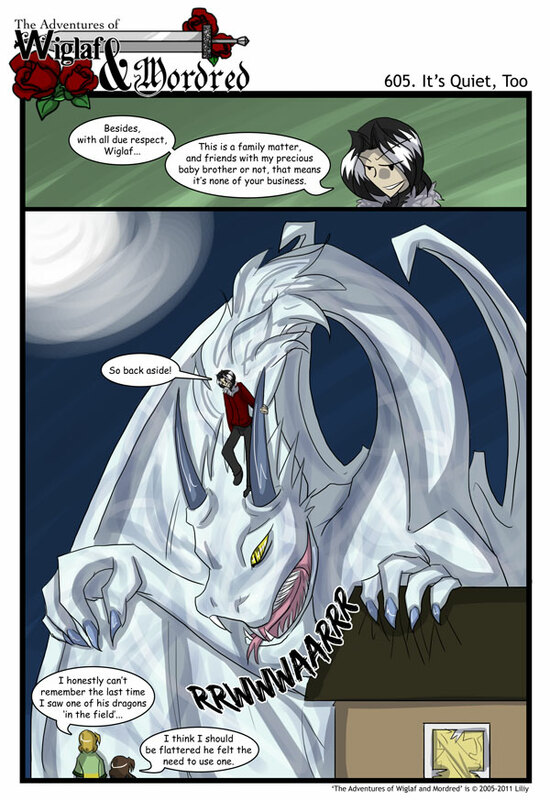 Dragons are hard. But that one is seriously awesome. Hey, Sedrick. You missed one. *NEED* nothing, he’s just enjoying showing off! …Not to nit-pick or anything, but “back aside”? Epic page indeed, Liliy, epic page indeed. Probably just an ‘Arthurism’… Anyways, kickin’ amazin’ page. This dragon makes me so incredibly happy. I cannot wait for it to be in color~! I KNEW IT! I KNEW ARTHUR COULDN’T BE SO STUPID AS TO HAVE ALL HIS DRAGONS IN ONE PLACE!! Glee! There still be Dragons here! Great job, Liliy. I love how you drew the dragon. And I love how Arthur rides on its hwad between the horns, too. Excellent work! Looks like Wiglaf is going to be spending some time replacing rood shingles when this arc is done. Do we know if Sedrick survives this arc? Because I can totally see him getting eaten by a dragon. Wow. Sedrick being eaten by a dragon. Would that be a Disney villain death? You know, I’m a pretty big fan of dragons, and I’ve got to say that this one is AWESOME!!! Whoah, I just realised, that thing has opposable thumbs….is there a reason we’re not worshipping our dragon overlords? YAASSS. What a beautiful dragon!